Meditating, Splinter has a vision of death. In the apartment in New York, the Turtles lounge around the living room. Klunk slips through a loose screen on the window and hops down into the alley. Raph tells Mikey to go get Klunk before he gets in another fight with the alley cat, but Mike just shrugs it off and continues watching TV. Down in the alley, Lilly the bag lady sees Klunk. Having three cats herself, she calls to Klunk. 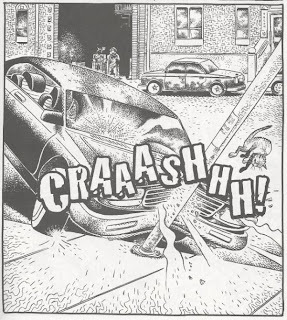 Klunk runs away into the street and right in the path of an oncoming car. The driver swerves to miss Klunk, but hits him with his fender. 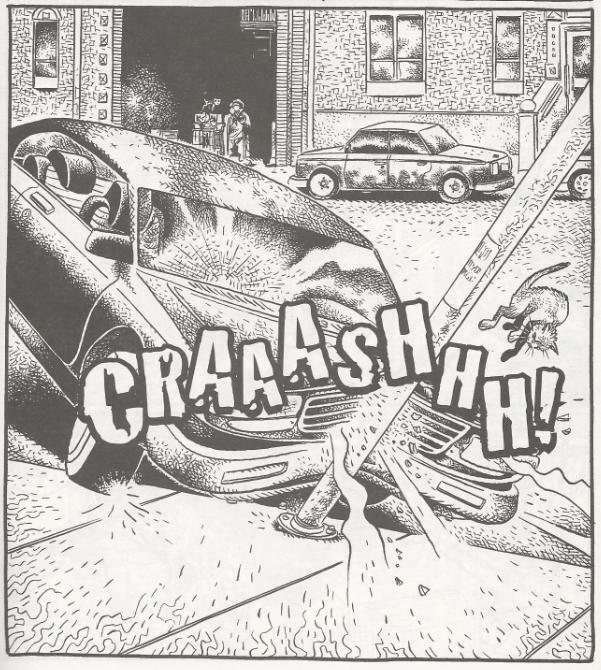 The Turtles run to the window and see the accident. The driver is angrily yelling on his cell phone about a cat causing him to swerve and hit a lamp post. Mike sees Lilly run over to Klunk’s injured body and carry him away. Angry and scared, Mike quickly puts on a coat and hat and leaves the apartment. Mike stops Lilly and demands Klunk back. He shoves her over and grabs his pet. Klunk is bleeding and will be dead soon. Mike panics and wants to get Klunk to a vet, but it looks like it's too late. Lilly tells Mike that Thomas, who lives by the river, can save Klunk’s life. Reluctantly, Mike follows her. A week ago. Splinter takes Mike for a walk down the sewer tunnels to have a serious talk. Splinter says that he recently had a vision of death and it was attached to Mike. He tells Mike that his love and compassion is one of his greatest assets, but that it’s also his greatest weakness. 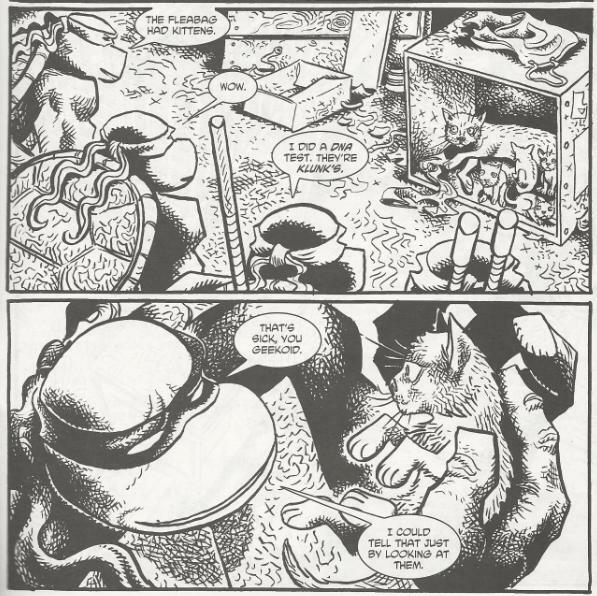 Splinter warns Mike that his enemies will not share in his sense of morality and that he must learn to steel himself so that he can make the hard decisions. The present. Mike returns to Thomas with a stray cat. He gives Thomas the cat, saying that it’s nothing but an alley cat that lives behind their apartment. Thomas asks if Michelangelo is sure that he wants to exchange Klunk’s life for this stray’s and Mike assures Thomas that “nobody loves it”. As soon as he says those words, Mike realizes that what he’s doing is wrong. He tells Thomas to let the stray go. Mike then takes Klunk and hugs him as he dies. As Mike leaves, the stray follows him. Looking on, Thomas tells Lilly that the stray was not a comparable life. Later, back at the apartment, Mike asks Splinter for a talk. Mike tells his sensei what happened and laments that Splinter was right; he was faced with a hard choice and he wasn’t able to work up the nerve to do it. Splinter tells Mike that he walks two paths; that of compassion and that of a warrior. Splinter feels that he has much to learn from Michelangelo. The Turtles then interrupt and ask Mike to join them in the alley. They show Mike the stray whom Klunk had been fighting with and whom he almost sacrificed to Thomas. The stray turns out to have been a mama and has just had a litter of kittens. Even more, they’re Klunk’s kittens. Mike picks one of them up and cradles it in his arms. *Thematically, “A Klunk Adventure” is an excellent short to read directly before this issue. *This issue was originally published with a back up story, “Community Service” by Sonia Murphy and Steph Dumais. Oh Klunk. Introduced way back in Michelangelo (microseries) #1, that little kitty has been around since almost the very beginning. Klunk’s always been there in the background, hanging out, but it’s amazing all the stuff he’s lived through. The Foot burning down April’s place, an exile to Northampton, Government spooks ransacking April and Casey’s apartment… And in the end, it was a car that did him in. For the animal lover (such as myself; we’ve always owned cats and dogs in my family), this is a tear-jerker. You never realized how much you cared about Klunk until he gets hit by that car and Mike has to say goodbye. But as much as Klunk is the centerpiece of “The Path”, the story is really a character study on Michelangelo. And in that regard, this is one of the best Mikey spotlight issues ever written. We all see Michelangelo as the “party dude” and the kid-appeal character; the friendly and marketable one. He’s also the comic relief, usually the first to screw up and the least skilled of all the TMNT. It can be pretty annoying and I’ve written my share of reviews summing up how much he can get on my nerves. But there’s a reason he’s like that. Michelangelo doesn’t want to be a warrior. He doesn’t want to spend his whole life fighting. The cartoons (and some of the comics) like to play this angle up as his being irresponsible or lazy; he’d rather be partying or playing video games than practicing and studying. But “The Path” offers a different angle on Mikey’s attitude. He doesn’t want to fight because he doesn’t want to hurt people. He doesn’t have the heart to make the tough choices; he’s a softy. Yeah, I know, I know. This runs rather at odds with how Michelangelo is portrayed in action-oriented ensemble stories, where he’s bashing Foot Soldiers to death with a smile and a quip. Heck, TMNT(Vol. 1) #1 has Mikey swearing a blood oath to Splinter to kill his arch nemesis for him. But Mikey’s a character who has grown and changed over the course of the series. By TMNT Vol. 4, he takes on the mundane occupation of tour guide for alien diplomats and loves it because he gets to meet new people and have fun and socialize. 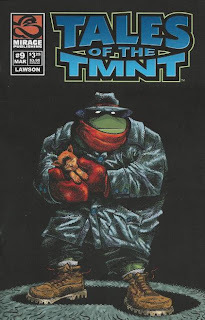 Mikey has grown as a character and so have the priorities of this book; the more simplistic, gritty and ultraviolent characterizations aren’t enough anymore. And in regards to Splinter forcing Mikey to swear a blood oath, even he’s growing as a character and learning the error of his ways. 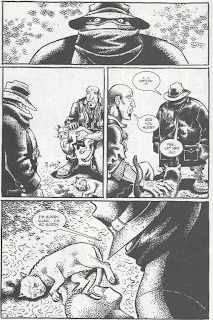 At the start of the issue (and by start, I mean the frontispiece, as this is one of those rare frontispieces that actually ties into the following story), Splinter addresses what he perceives as a weakness in Mike’s character; that if he is to be a warrior, he cannot be so soft. When push comes to shove, he’ll have to toughen up and make a difficult decision, even if it hurts. At the end of the issue, though, Splinter realizes that he was wrong; that HE was the one pushing Mike to be a warrior, disregarding his son’s own set of values. If Michelangelo had “steeled himself” and made that hard decision in his own self interest, he’d have actually made a terrible mistake. It’s a humbling experience for Splinter (and you know how much I love those) and he concedes that his son’s compassion isn’t a weakness, but a strength, and that he’s free to walk his own path in life. 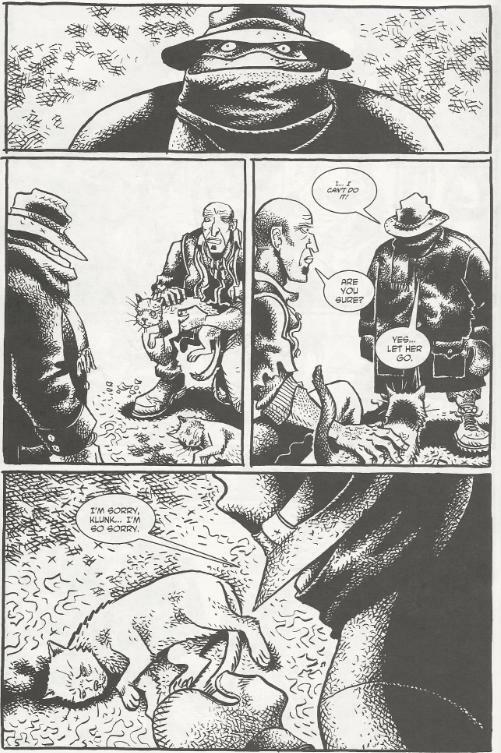 And the moment where Michelangelo makes that choice is a beautiful bit of storytelling on Lawson’s part. It’s a sequence where the decompression really works. Michelangelo says “nobody loves it” and then silently realizes what it is he just said. Then he has to make the decision to let Klunk die, and god, the look on Klunk’s little kitty face as he stares back up at Mikey and dies, it’s just so well done. If you’ve ever had to go through the pain of putting a pet to sleep, you know exactly how Mikey is feeling right there; the guilt and helplessness and sorrow. The scene really hits all the chords; just excellent work from Lawson. In the end, though, there’s a message that life goes on. The cat Mike spares turns out to have been carrying Klunk’s litter and Mikey ends up adopting one (I don’t think it ever gets a name, but the kitty will show up throughout Vol. 4). It’s a bittersweet end, as Klunk is gone, but he’s left behind a legacy. It’s that same feeling you get after you’ve said farewell to your pet and adopted a new one; that lingering sense of loss combined with that newfound sense of joy. “The Path” is a vital tale when it comes to understanding who Michelangelo is at his very center. He’s just a sweet, soft-hearted guy who doesn’t have it in him to so much as kill a stray cat, but that doesn’t make him a weak individual, either. That compassion is his strength, allowing him to go in a direction completely different from where his brothers are headed. Plus, we don't how Thomas "The Magic Man"'s magic works, maybe it's a bit like "Pet Sematary". So, it's safer this way.